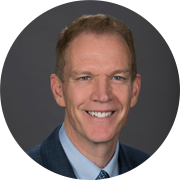 William (Bill) P. Senneff is the president and chief executive officer of Vizient Southern States and Phoenix Health Care Management Services, Inc. Appointed to this position in 2018, Mr. Senneff will use his 30-plus years of executive-level experience in hospital administration, health care performance improvement services and innovative business ventures to lead both companies. He was previously interim president and chief executive officer of Vizient MidSouth and Phoenix Health Care Management Services, Inc. In 2008, Mr. Senneff joined Vizient, Inc., the largest member-owned health care services company in the country, as president of Vizient Gulf States, a geographic network comprised of over 20 health systems in Louisiana, Mississippi and Tennessee. In 2015, he accepted additional leadership responsibilities as executive officer of Vizient West Coast, a 22-member geographic network that includes health systems in Arizona, California, Hawaii and Oregon. Prior to that, Mr. Senneff was chief operating officer at St. Edward Mercy Health (a 4-hospital network) and president at Sparks Health System, both located in Fort Smith, Arkansas. He has also held management positions with Cox Health Systems, Western Medical Center and Humana Hospital in Anaheim, California. Mr. Senneff earned his masters of health administration from Washington University School of Medicine and his bachelor of science from Southern Illinois University in Edwardsville, Illinois. Additionally, he is a Fellow of the American College of Healthcare Executives (FACHE).